Research on a bacterial toxin has led to the development of a new blood test for the early diagnosis of ovarian cancer – a disease which kills over 150,000 women globally each year. The test has the potential to improve early detection of the disease, although further testing is required before it is clinically available. A research team from the University of Adelaide and Griffith University studied the interactions between the toxin and an abnormal glycan expressed on the surface of human cancer cells and released into the blood. They engineered a harmless portion of the toxin to enhance its specificity for the cancer glycan and used this to detect it in blood samples from women with ovarian cancer. 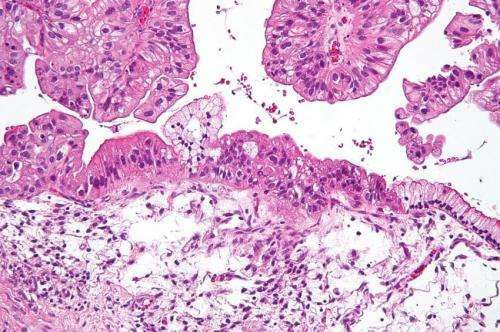 A paper published in Biochemical and Biophysical Research Communications showed that the new test detected significant levels of the cancer glycan in blood samples from over 90% of women with stage 1 ovarian cancer and in 100% of samples from later stages of the disease. “Ovarian cancer is notoriously difficult to detect in its early stages, when there are more options for treatment and survival rates are better. Our new test is therefore a potential game changer,” says Professor James Paton, Director of the University of Adelaide’s Research Centre for Infectious Diseases. Currently, the team is seeking scientific and commercial partners to further test the technology with larger numbers of patient samples and to adapt it for mass screening. © Created and maintained by MPower Communications LLP.